A diagnosis of cancer is a life-changing event for both patients and their loved ones. Hearing that word, “cancer,” associated with you is a surreal experience that can have profound effects and trigger an array of emotions, leaving you lost, confused, angry and overwhelmed, or even causing an almost catatonic inability to decide what to do next. Regardless of what type of cancer is involved, a myriad of questions arise: How will my cancer, and the treatments I will have to undergo, affect me? What can I do to prepare myself for the battle ahead? What effect do things like diet, stress, attitude and faith have on my chances for survival? And, perhaps most importantly, “How can I go through this experience and maintain my sense of hope and normalcy? 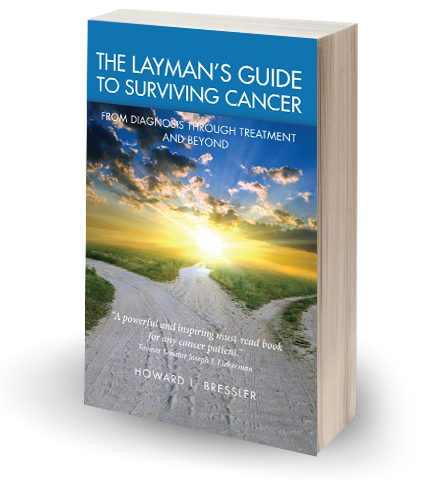 In The Layman’s Guide To Surviving Cancer: From Diagnosis Through Treatment And Beyond, Howard Bressler -- himself a leukemia survivor -- addresses these and other questions and the physical, emotional, dietary, holistic and spiritual aspects of dealing with a cancer diagnosis, helping the reader along the path to a healthy body and mind. Using his personal cancer experiences and his legal experience, Howard breaks down the practical aspects of dealing with cancer, empowering you and your loved ones to defeat whatever challenges you may encounter along the way.